The safe way to collect and store Flammable Hazardous Waste is with Securall Hazardous Waste Drum Cabinets. Cabinets are equipped with a shelf to hold 5 gallon containers. The Resource Conservation and Recovery Act (RCRA) has made it mandatory that hazardous waste be collected and disposed of properly. 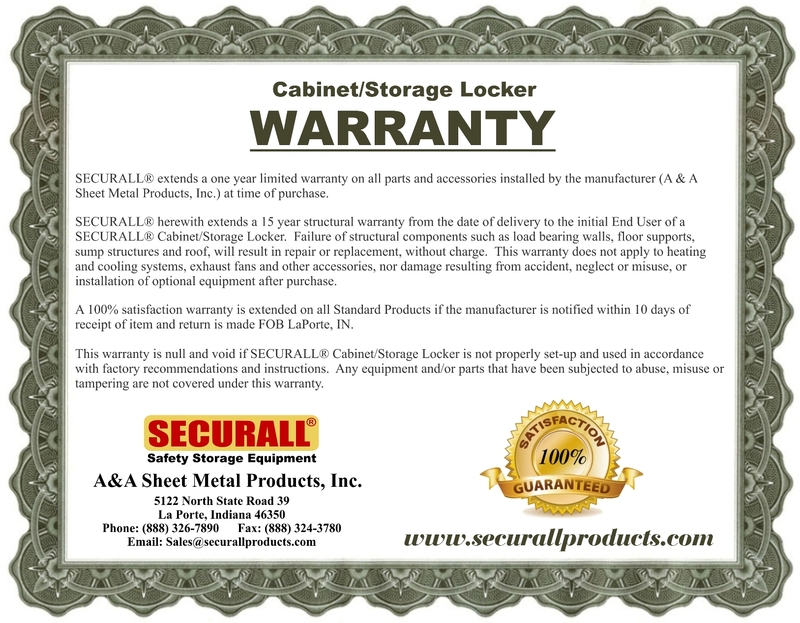 Securall offers the largest capacity drum storage cabinets in the industry. All Hazardous/Environmental Waste Drum Cabinets are equipped with Roller Bottoms for easy loading of heavy drums. S4-05 Addn'l Shelf; Capacity: 500 lbs. per shelf, Approx shelf dim: 39 11/16 W X 26 1/2 D, Approx Ship Wt. 21-lbs. BR24-Steel Drum Cabinet Ramp with Slip Resistant Strips; Approx dim: 23 x 24 x 1, Approx Ship Wt. 30 Lbs. WP90 - WeatherProof Package (Factory Installed) for Outdoor Storage with Stainless Steel Padle Handle, and Forklift Channel with Bolt-down Bracket ; Dim: 43 W x 31 D; Approx Ship Wt. 60 Lbs.